Latino Arts – Only YOU can make it happen! THANK YOU to everyone who donated to our 2018 Year-End Campaign. We raised over 50% goal in less than two months, which is an important milestone for our organization. We recently received big news – Opera Cultura has been awarded a $5,000 CHALLENGE GRANT from the Castellano Family Foundation. Our goal is to meet the challenge by June 1, 2019! Bring opera into low-income elementary school classrooms! 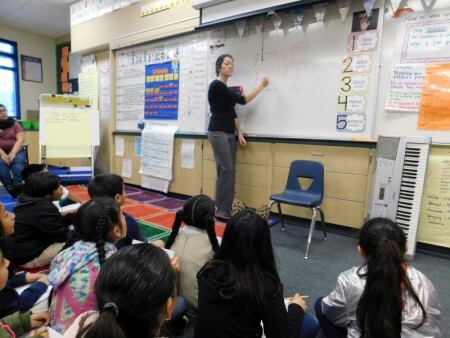 We are bringing a six-week artist residency program to Title 1 elementary schools in San Jose. Make the arts more accessible by providing free activities for all ages in our community, such as the educational art and writing workshops for youth that we host every year, and free preview performances at local libraries. Secure the future of the arts by helping us train and showcase young and emerging artists & composers, through initiatives like our Canto: Online Vocal Competition and New Voices Concert. Provide jobs for the very talented singers, musicians, designers, and all who are involved with our productions. Sustain and promote Latino - Hispanic arts & culture in our community and region. This is central to our mission and a critical issue in our country today! 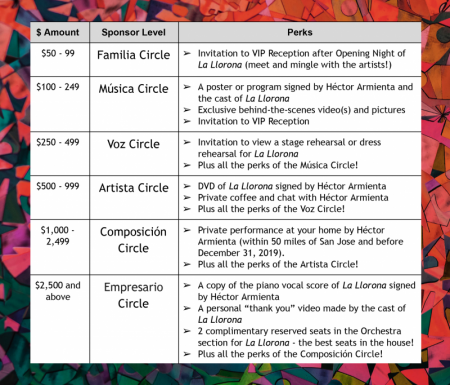 To thank you for supporting Opera Cultura and the local arts community, we are offering special gifts for each sponsor level! (See the image below or the list at the bottom of the page). Your contribution will make a world of difference for Opera Cultura and for all in our community. Thank you! Jan-May 2019 - Coyotes & Rabbits Elementary School Residency Program: CLICK HERE for more information on this program. February 2019 - The second annual Canto: Online Vocal Competition: CLICK HERE for more information. April - June 2019: Youth workshops and free community events - TBA! June 28-30, 2019 - La Llorona/The Weeping Woman: CLICK HERE for more information. 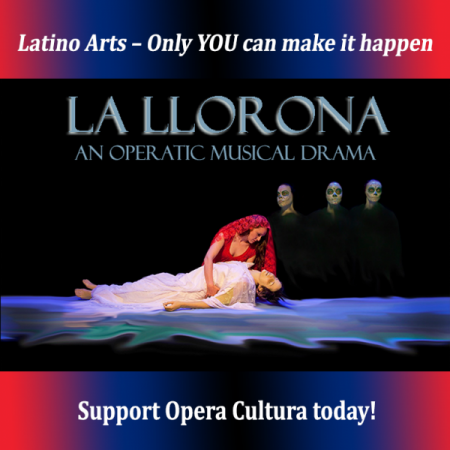 Opera Cultura is a 501(c)(3) nonprofit, EIN #46-433-2937. All donations are tax-deductible. Click here to donate to Opera Cultura through JustGive.org. A poster or program signed by Héctor Armienta and the cast of La Llorona. Plus all the perks of the Música Circle! Plus all the perks of the Voz Circle! Plus all the perks of the Artista Circle! 2 complimentary reserved seats in the Orchestra section for La Llorona - the best seats in the house! Plus all the perks of the Composición Circle!